Blogger worked! I have a picture! Be still my beating heart. 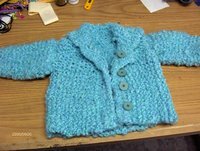 This is the baby sweater (18 mo size) I finished knitting for my newly-born cousin. The buttons aren't sewn on yet in the picture, but you can get the idea. This was taken before it was blocked too. I have a ways to go with my knitting prowess, but I'm getting there. I need lessons on putting seams together, seamlessly. Many of my creative endeavours right now are for Christmas gifts and, because the recipients read this blog, I can't show them. I'll try to take pictures of everything and will post them after Christmas for you to see. 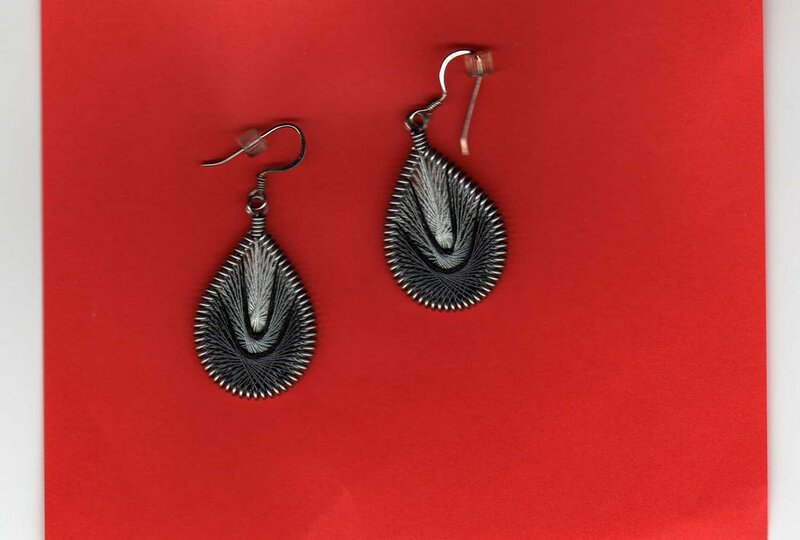 I am so excited to find out what the technique is called that was used to make these earrings! Thanks to SharonB (www.inaminuteago.com) I have just now discovered that it is called 'Ganutell' , which apparently is a fairly old art which originated in Malta. More info can be found at www.beadsky.com and at a few more places available on Sharon's site. The earrings reminded me of the old string art we used to do, most probably back in the early 70's, only much finer. Imagine my surprise to see that Sharon had found the real name for it. It sounds like pretty much all you need is wire and either silk thread or floss. This is only technique I have to try! ...so I'm hopeful he can figure out what I'm doing wrong for the pictures. We're heading off to the city this afternoon to pick up #2 son and his girlfriend. I don't think he uses blogger tho, so it might be a fruitless venture. We'll see. He has an appointment for tomorrow to take his final driver's test, so keep your fingers crossed! I spent yesterday at Kym's for our CQTeer meeting. One of the members wasn't there, so it didn't seem the same (missed you Irene!). Kym showed us a technique for laminating and Sue showed us how to do a really cute folded paper envelope which could hold an atc or a bag of tea for a gift. 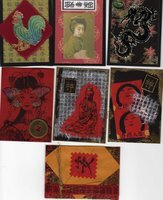 We exchanged our atcs for the month - Oriental theme. It's the second time we have done this theme because we all liked it so much. UPDATE! OK..now I'm really confused! 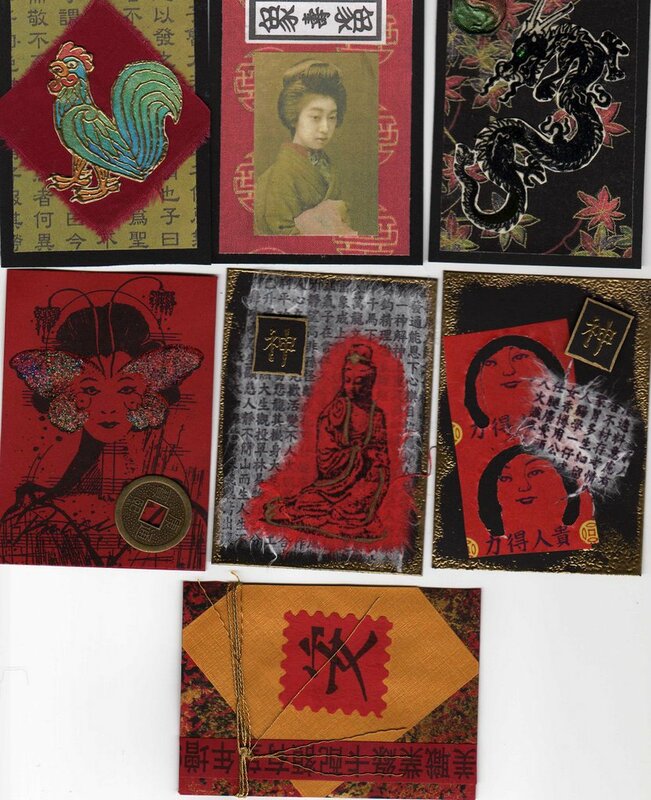 I suddenly had a brainwave (doesn't happen often, so be impressed) and tried scanning the atcs from yesterday to see if scanned pictures would 'take' in Blogger. They did. Now I'm led to believe it's something about my camera that's not working correctly. Oh dear. Anyway, enjoy the atc's! Hopefully you can click on them to enlarge the picture but at this point I'm not sure of anything. Obviously it didn't work. Hmm. Does anybody have any ideas as to what could be happening? Is anyone else having trouble with Blogger? Never mind, don't bother to answer that. I know already it's only me because it always is. Spent this morning grubbing in dirt. It was high time all my houseplants got either a fresh treat of soil or needed to be split off into more because they were totally potbound. Now I've likely killed several of them with kindness and will regret not having left them alone. Time will tell. 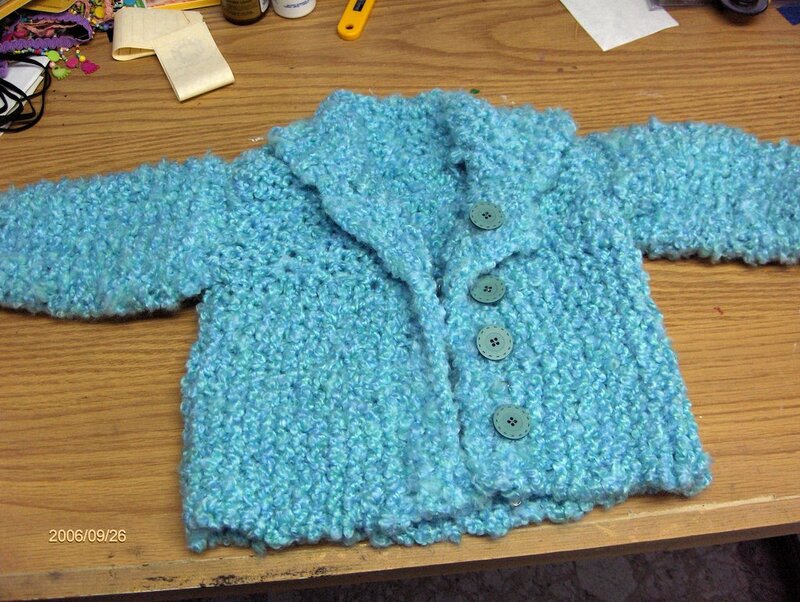 This afternoon I hope to finish putting the buttons on the baby sweater I finished knitting a few weeks ago. I made it in an 18 month size so it's not a pressing thing to get it delivered but thought I'd better finish it so that it didn't sit around til the kid himself is 18! I'm still trying for pictures. This time it took foreeevvveeerrr and I still don't know if it worked! This is a test run. I still can't get Blogger to upload pictures and have no clue as to why. Tomorrow when I have more time I will have to play around and see if I can figure it out. In the meantime, sorry bout that! Kym and I spent our three days at the fair and I think we are both glad it's over. It's fun meeting people and being able to spend three days just working on our various crafts though. Next year the fair will be moving to their new location and rumour has it that pretty much everything will be in tents, which is not a place where we want to be. My yoga class has started again, which is something I thoroughly miss over the summer. Of course I don't miss it enough to continue it on my own! I'm not that dedicated. Blogger is still not happy about loading my pictures, which is rather strange. This afternoon will be spent readying myself for a three day stint with Kym at the local fair. It's her booth, but I go to keep her company. We can't just go and sit there with nothing to do (and nothing to eat) so we have to take lots to entertain us. Boredom is simply not good for either one of us, since we can manage to get in enough trouble even if we have lots to do! We both have to lug our Obus forms and our pillows to sit on because the chairs they give us to sit on have to be the most uncomfortable things, especially when we're parked in them for three days!! It's fun though, because I love talking to people, some of whom I only see at the fair. There would have been pictures..
...except Blogger is not letting me load them today. Maybe tomorrow? Do you ever have one of those days where you seem to spin your wheels and nothing gets done? I can honestly look back over my day and say that's pretty much all I've done, at least in the constructive sense. Had my chiropractor appointment, went out with Kym for a bit, family here for tea this afternoon and that's it. Spent two hours in my workroom and I haven't a thing to show for it. I can't even tell you what I did, other than cut out four pieces of card stock for some atc's. Now you know why I need another year to get anything accomplished!! Two things learned today, so far, and both of them decidedly not the sort I really wanted to learn. #1 was that I learned one should not monkey about with a stuck blade on a rotary cutter. One should, if one were smart, just throw the darn thing out! It sure would be nice if some brilliant mind could come up with a rotary cutter that could differentiate between what it's supposed to cut and a finger. Before you ask...I'm not bleeding - much. #2 lesson in stupidity is that one should remember when shutting the door on the medicine cabinet that one should really remove one's thumb from the shutting mechanism. I scanned these yesterday for practice with my scanner and, if you enlarge the pictures, you can see some of the details I've done from SharonB's 100 Details for 100 Days series. For those interested, I think Days 4, 15, 16, 20 & 27 are on here. There might be more, but those are the ones I'm sure of. 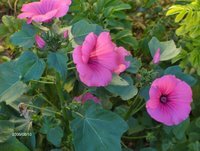 For anyone who doesn't know, SharonB's blog and the 100 Details series can be found here: www.inaminuteago.com (one of these days I will figure out how to link properly!). Another really great blog which has lots of designs available belongs to Pam Kellogg (http://kittyandmedesigns.blogspot.com). 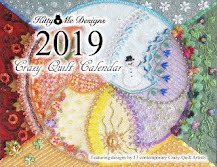 She has also been doing 100 designs and has some pretty nice patterns you can download. Jack is off helping BIL with his building of the quonset hut again today, so I have a day to myself! We have a challenge in our CQTeer group to make a book, so I'm off to work on that. Attempt # 2 to learn the scanning operation of the new computer...is this better? Hope so! These pictures of of 4 atc's I've done over the past while. The two flower ones were a technique I learned at our CQTeer group. Really simple to do! 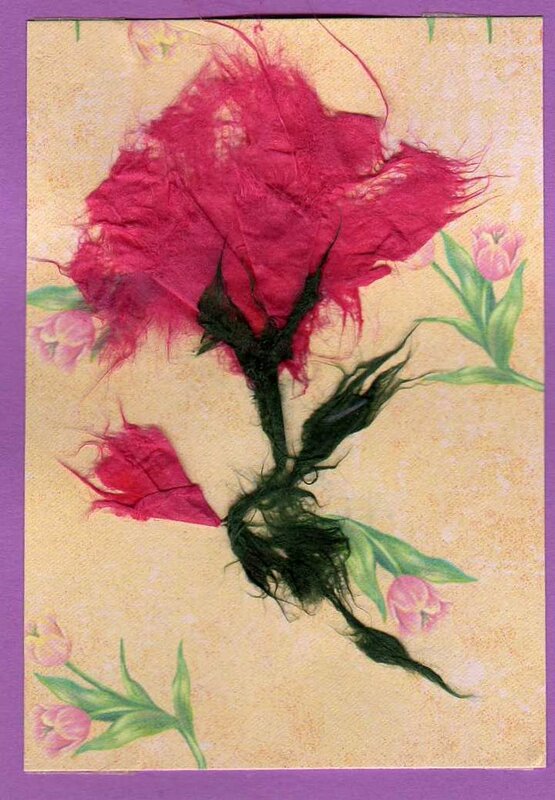 You just moisten the paper and gently pull on it to make the flower petals. They separate so nicely. 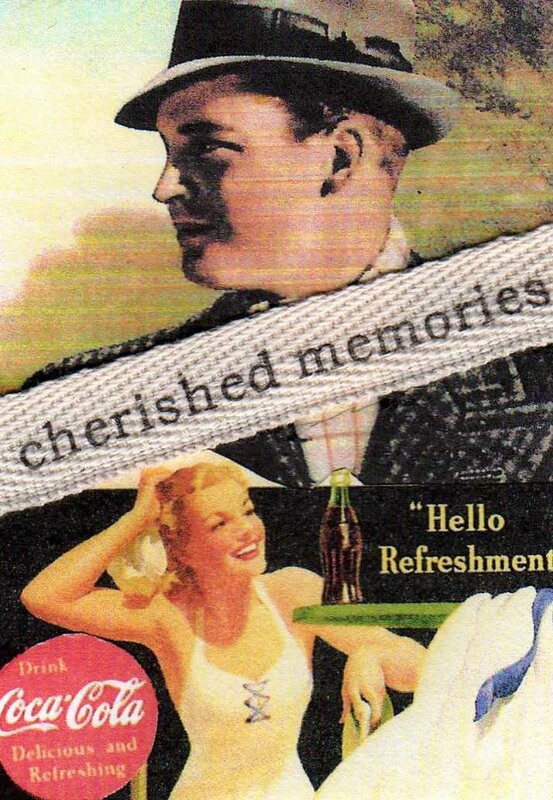 'Cherished memories' is a card I made for a Father's Day swap (again CQTeers). 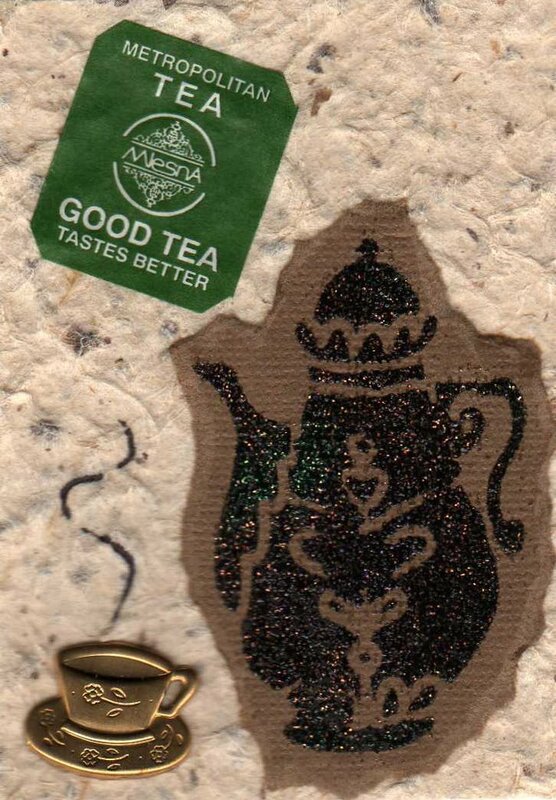 The final one was done for a 'tea and coffee' theme swap. The paper I used was a recycled card I picked up at the dollar store locally. They have lots of cards (and envelopes) made with handmade paper & are really cheap, especially when you only want a small bit of any one. Tomorrow, or maybe later today, I have another couple of pictures of a round robin CQ piece I've been finishing up using the techniques from SharonB's 100 Details series. I'm very sadly behind now but am determined to do them all. I have also decided to take another year off from doing any work for others (other than what I do for gifts). For those of you who didn't know, I took 2006 'off' to concentrate on some of my own projects and ideas. Unfortunately the year hasn't been nearly long enough to make a dent in my 'want-to-do' list. So, I'm taking another year...just because I can! Here I was, being so proud of myself for figuring things computer out all by myself, but after reading yesterdays blog I realize that I have now descended back to earth with a thump. Yes I can scan, but no, I don't really know how to do it properly. That's what I get for bragging on about my supposed capabilities. I can see him from here. That little computer geeky creature pointing his little finger at me and laughing maniacally while clacking his heels together in glee over besting me - again. All I can do is hang my head in shame and crawl back into my hole and promise my reader(s) that another day will dawn and I WILL master this thing - computer geeky creatures be darned! I'm doing a test run on my scanner, just to see how it works. I scanned in a copy of the chocolate-themed recipe card swap pieces I did , just to see how it works. Not sure about the quality at this moment, but will enlarge the picture once it posts to see what it's like. I showed the background paper and how I made it before the computer died. On top of that I put a transparency made using packing tape and used some paint chips (free..shhh) in colors that were named in appropriate chocolate titles. The word 'desire' was a rub-on sticker from the dollar store. 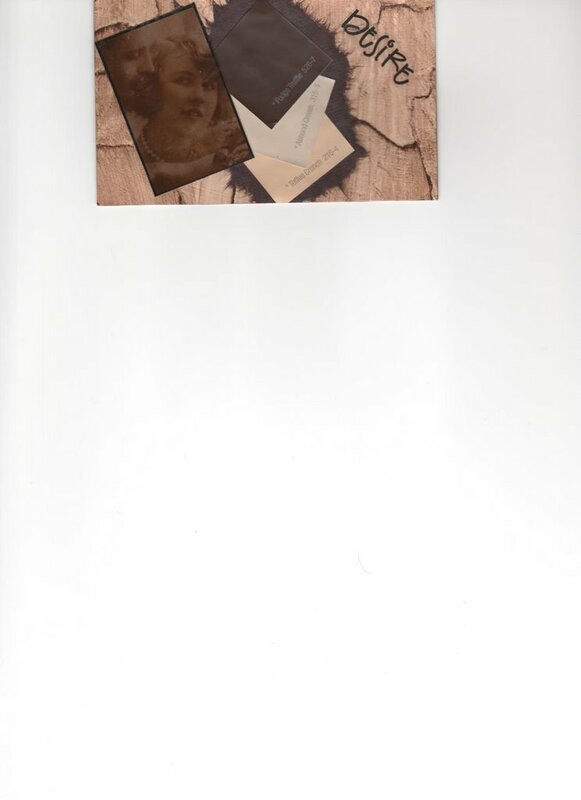 The cards I sent out had tiny glass beads (in copper) as a 'frame' for the picture and I also glued on a little feather in the bottom right corner. I can't wait to get my collection back to see what everyone else did. Kym was here for a 'sew day' today, but, as usual, I think we spent more time yakking. Isn't that what sew days are for? I worked on one of my Christmas presents and she played with a machine of sorts that is marvelous for stringing those mind-numbing seed beads onto something useable in the way of thread or wire. Far superior to having to do each single one by hand. 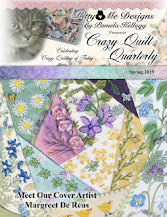 Yesterday was the first quilt guild meeting for the year and I felt totally out of the loop. After five (or was it six) years of being their librarian others have taken over and I got to attend a meeting without a huge amount of work. I didn't know what to do with myself! Several people asked me if it felt weird and I would have to say that would be an understatement. I actually got to leave in time too, which was even more of a shock to my system. Our speaker this time told us about the Underground Railroad and how quilts were used to assist the runaway slaves to reach freedom. The quilt patterns they used each signified a different instruction to the slaves. Quilts were used because only a few of the slaves could actually read or write and therefore would need visual help opn their way. It was quite normal for people to put quilts out to air anyway, so the slave quilts were not noticed as being unusual. It was a very interesting talk and I felt I learned a lot about those times. Now I have my camera working again and can post pictures, I guess I had better get busy and take some! One of my next chores has to be putting in the software for my digital camera so I can start showing pictures again. For those of you that like the pictures, please hang in there. I'm getting to it. After my question I posed on Saturday I have to assume that nobody can think of five things that represent them? Either that, or everybody is shy. C'mon, fess up! I think it's an interesting topic and one that, hopefully, can make each of us take stock of ourselves. I'm a huge fan of Jeffery Deaver (who writes really good mystery books) and I came across this in the latest book I read and think it's also something to really think about. I know it never occured to me before! "The starlight we see is thousands or millions of years old. By the time it gets to earth the stars themselves've moved - some of them have already burned out and disappeared." -from The Bone Collector by Jeffery Deaver. Funny how we never think about that. We know the concept of light years, but putting it into this context really is mind-boggling. 1. Books. They would have to top my list, no question. They have been in my life ever since I can remember. I collect books, I inhale books, I revere books. Subject matter isn't necessarily important. Craft books, mysteries, how-to's, romances, biographies - they all are my friends and define who I am. 2. My friends. Need I say more? They feed me, they nuture my soul and are all so very special. I know there can be some question as to how my friends can 'represent me', but I think they do. They represent my choices in life and each of my friends fulfills a different need in my life. 3. My family. My husband, who treats me like a queen, and has done for more than 27 years. My sons who, despite my being a horrible mother for many years (a subject for another day), have turned into two of the nicest human beings I would ever want to know. Yeah, I know, mother love is partly the reason I say that, but I truly am glad to know them and to know that in some way I was part of that. 4. Crazy quilting. When I discovered this, I was in heaven. My years of trying many varying crafts have now blended pretty much into one. Who would have known that pretty much every technique I've done over the years would now be useable in one art form? 5. My sewing machine. Where would I be without it? Now, it's your turn! What 5 things represent you? Please leave your responses in the comments. We've had a lovely day touring about the countryside. We got as far as Huntsville and then across Algonquin Park. The leaves aren't quite in full colour yet, but some were starting to turn. We didn't see any wildlife in the park, but did see three deer in someones front yard in Huntsville! And before you ask, they were real deer. It seemed odd to see them in the downtown core. Jack, being the loving husband he is, even let me look around a quilt store (Huntsville has a really nice one); a used bookstore AND a bead/wool store. Poor long suffering man. You all should be impressed though - I didn't buy a thing! I could cheerfully have spent a small fortune in the quilt shop - they had some gorgeous fabrics I would have loved. New computers aren't that cheap and I know I have to cut back on my crafty things for awhile. One more excuse to use up my stash! I'm back. I have a new computer which I am still learning to use. Wonder of wonders, what a difference a new keyboard makes. I no longer have to punch each letter in to make it 'take'. Now I have the opposite problem, that of making too many letters and in all the wrong places! I really can't believe how much I have missed being able to use a computer. After all, it's just a machine, right? I don't think so, at least not anymore. I felt so out of touch with everybody! I am now the proud owner of my first brand new computer (no longer am I using hand-me-downs from my kids!). It's a Compaq Presario in a really sleek black, which is really all I want to know about. There's no point in me quoting you all the specs, because I haven't a clue what they mean anyway. While I've been 'away' I have managed to accomplish some things, none of which I am able to show you at the present moment. Two reasons - I haven't had time (or the courage) to instal the software for my camera; and...most of the 'stuff' I've been working on are for Christmas presents. Can't you tell I've been at loose ends when I start on Christmas before it's at least October?? Yesterday we got a new furnace (changing to gas, from oil) AND, because we no longer have to have an ugly old oil tank in the furnace room, I get some more space to store my 'stuff'!!! I realize now I should have taken before/after pictures, but forgot. I have two chests of drawers going in there to fill up, plus I think I'm getting some sort of shelving for my magazine storage. At last I'll be able to have some system for my paper bits, my magazines, and my wool. YES! On that note, better go & do some catching up with all the blogs I've missed reading. Sure am glad to be back!